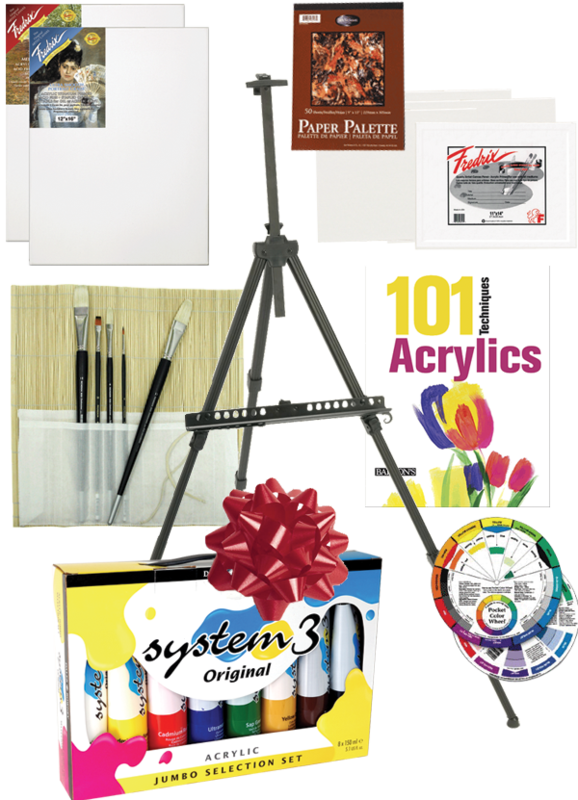 Here Rex Art we know how hard it can be to pick the perfect gift for the artist in your life, especially if you don't know the first thing about art supplies. 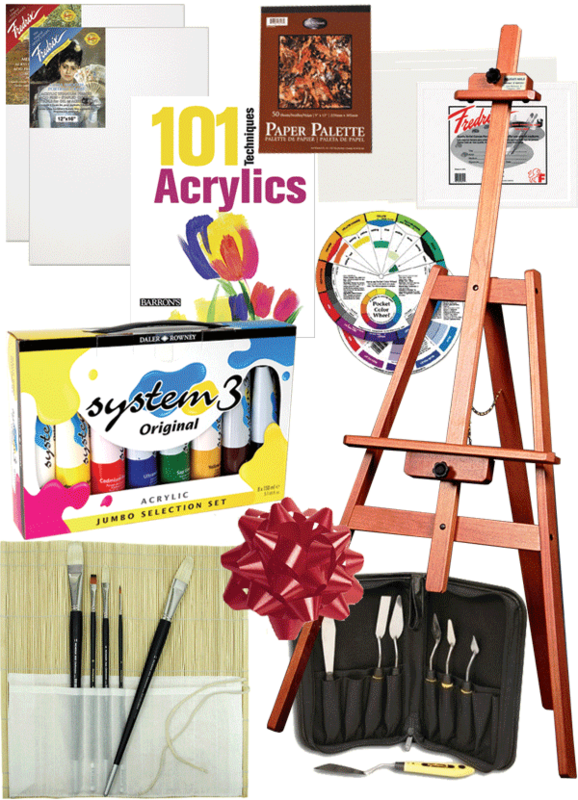 Let us offer the experience that comes from over 50 years in the art supply business to help you pick that perfect art gift! Our purchasing department has reviewed thousands of gift ideas and picked the cream of the crop. 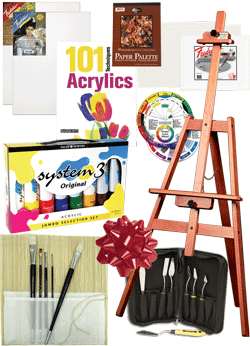 Below are some of the best gifts for artists that can be found on the planet. Plus, remember if you have any questions please do not hesitate to contact us at 800-REX-ART2 or email us at service@rexart.com. We have friendly, knowledgeable Rex Art Staff members standing by to help you, and no question is a stupid one! Let Rex Art help make your artistic gift selection a painless experience! 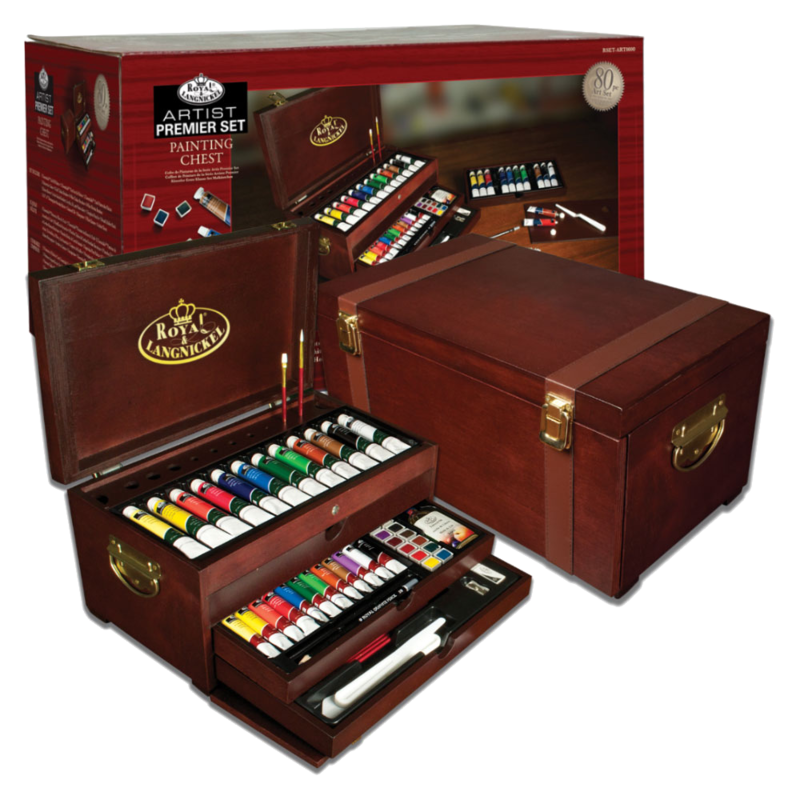 Rex Art's exclusive Acrylic Painting Gift Set for 2016 is back! You know at Rex we are all about the best values we can find and at the same time meeting our rigid quality standards. You can be confident that our Rex Gift sets deliver on that promise! Daler-Rowney, is one of England's oldest, and finest producers of art materials. They have been producing and innovating art materials since 1783. 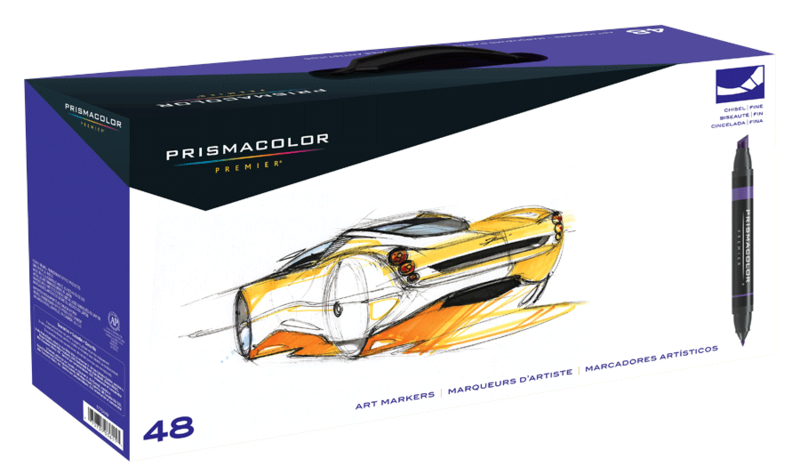 Obviously quality matters to us and to Daler Rowney, and the System 3 Acrylic Jumbo Set included in this year's set does not disappoint. It includes 8 huge 120ml tubes of System 3 Acrylics. Most painting sets include tubes that are around 25ml, but the System 3 tubes are almost 5 times that size! What does that mean for you as the gift giver? A lot more paint for your recipient to enjoy painting with! The Alvin Aluminum Field Easel is the perfect mixture of stability and portability. It holds up to 25 lbs., yet weights only 2 lbs. 8 oz. Great for the painter on the go or for artists who live in small spaces (think tiny big city apartments!). What good is a painting set if you don't have something to paint on? And not just paper, but how about real artist canvas! That is why this year we have included two 11" x 14", top quality Red label and Blue label Fredrix canvases. These are gallery wrapped (no staples on the sides) artist quality Fredrix stretched canvases so you can hang them without the need of framing as soon as you are finished painting your masterpieces. Also, we have included three 9" x 12" Fredrix canvas panels for more practice and painting. The Richeson 9" x 12" Disposable Paper Palette is a fantastic way to mix your paints and then when you are done you can rip the top sheet off the pad and dispose of it without any mess! A large selection of products are great, but good instruction is equally important. This year's set features Barron's 101 Techniques: Acrylics, which is loaded with 101 easy-to-follow exercises laid out in a progression of step-by-step captioned illustrations. We know a lot of people are intimidated by mixing colors and that is why we included a color wheel, which is a fantastic and handy tool for learning color theory easily. Last, but certainly not least, we have included the exclusive Rex Art Ultimate Oil & Acrylic Brush Set in a Bamboo brush holder. 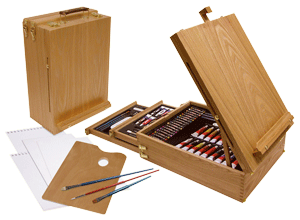 This set contains artist quality Richeson brushes custom selected based on our specifications and quality standards. It also comes with a handy bamboo brush holder, which is great for drying, protecting and transporting your brushes. Remember you will not see our Acrylic Painting Gift Set anywhere except Rex Art, and it is offered at a fantastic price just for the holidays with Free Standard Shipping! We build our sets from the heart, and we only include the best of the best products from our inventory of over 20,000 art supplies. We know you are going to love giving these sets as much as we love creating them. These always sell out early in the season and are available in limited quantities so don't delay and order now! 3 Fredrix Canvas Panels - 9" x 12"
Rex Art's exclusive Acrylic Painting Gift Set for 2016 is back, and better than ever! You know at Rex we are all about the best values we can find and at the same time meeting our rigid quality standards. You can be confident that our Rex Gift sets deliver on that promise! 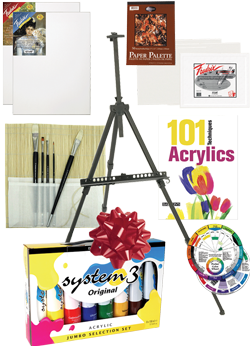 The Richeson Lyptus Navajo Easel, which is an ideal all-purpose easel that offers all the features a new artist needs. It is very sturdy, easy to use and adjust. No need to pull out the screwdriver - it's fully assembled and made of Lyptus, which is a sustainably harvested wood. When you start painting most people only think of the brush when applying paint to your substrate, but there is a whole group of painters that actually never even use a brush! That's right! In fact, there are a school of painters that only use a palette knife when painting. But how do you know if you like using a brush, a palette knife, or both? 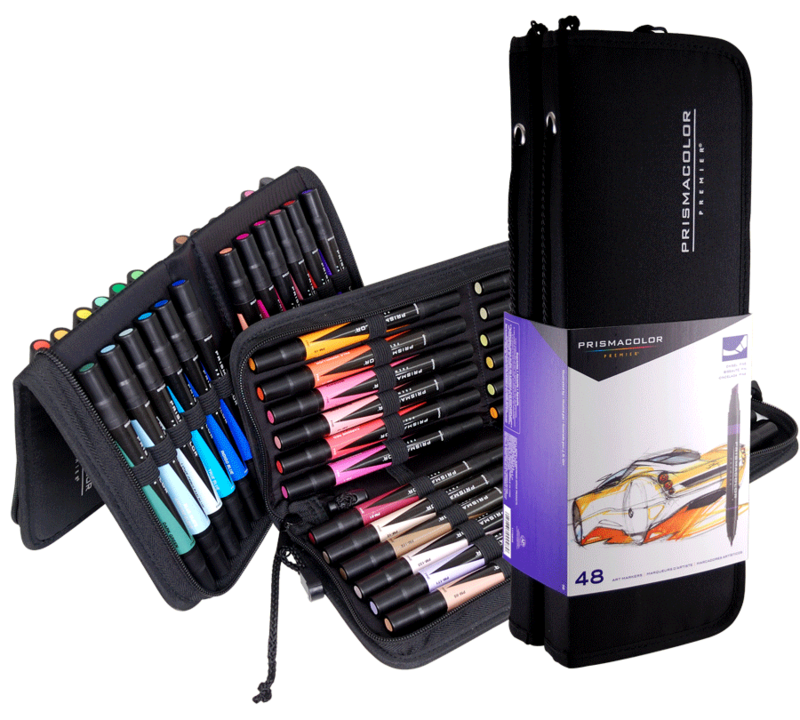 That is why we included Daler Rowney System 3 7 Palette Knife Zip Case Set, which includes a selection of 7 palette knives in a handy durable zip case. 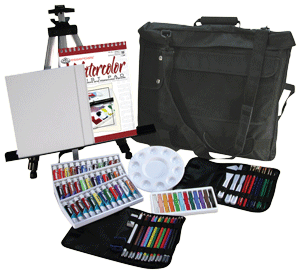 Ideal for a wide variety of painting techniques, and the perfect set to test your artistic creativity with the palette knife. Plus, it even comes with a hand case to keep them protected, and stowed away for easy travel or storage. 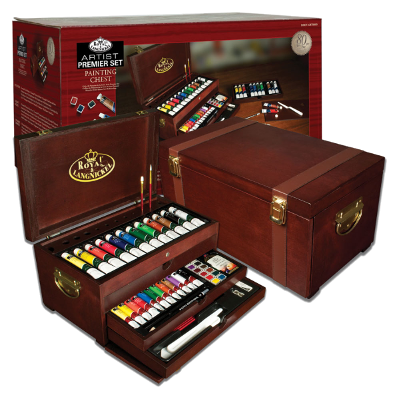 The Royal & Langnickel Painting Chest is perfect for anyone looking to study the world of painting, whether it be oil, acrylic or watercolor. 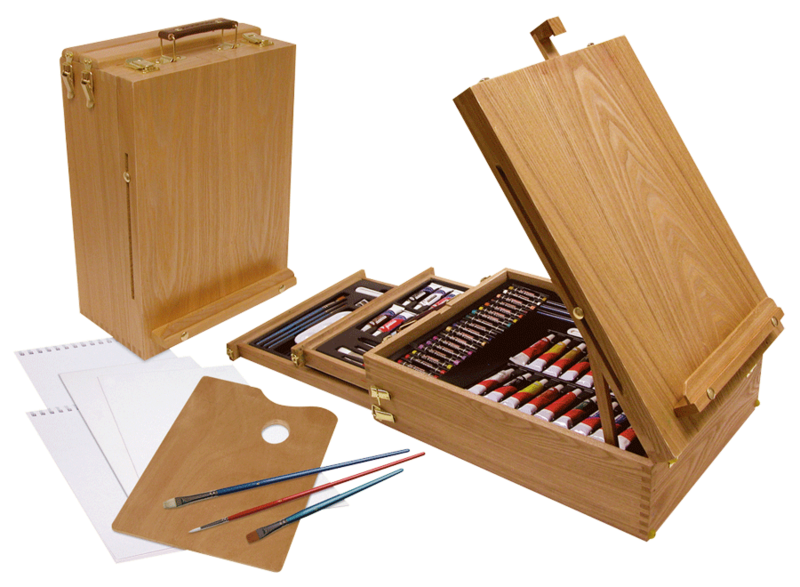 This set features an abundant collection of high quality painting supplies that fits neatly into a beautiful, multi-compartment wooden storage chest. 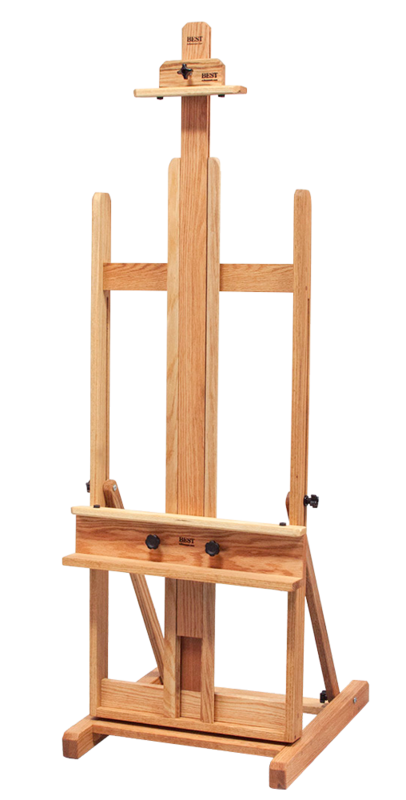 This moderately priced yet elegant easel features a strong H-frame construction and offers a variety of easy to make custom settings for standing or sitting. 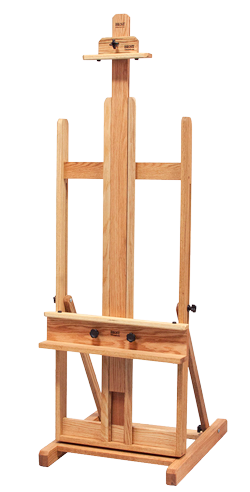 This is Rex Art's most popular Best easel. Adjustable sliding mast moves independent of canvas tray. Wide bottom canvas holder with utility tray. 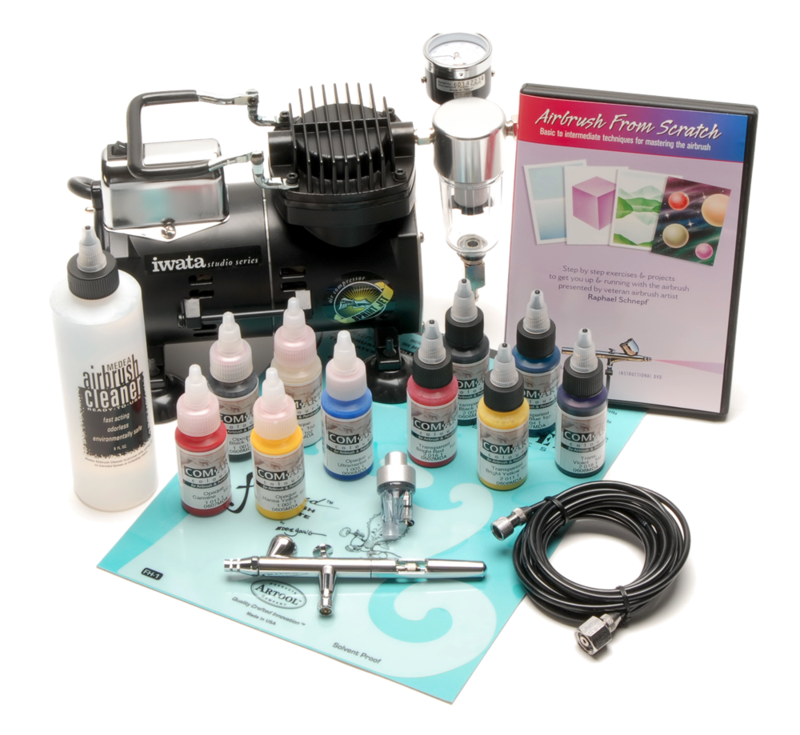 This is the ultimate set for a professional artist. Old Holland Classic Oils have long been considered some of the finest oil paints on the planet. Only the finest pigments, and linseed oils are used. Unlike, several other manufacturers Old Holland does not use any fillers such as chalk, barium sulfate, or wax. 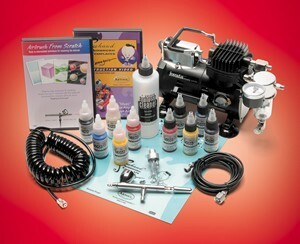 The Sprint Jet compressor proves ideal for the occasional and professional artist doing general airbrush applications. It’s powerful, compact, reliable and quiet. An Instructional DVD on airbrushing. Non-toxic, and ready to use, Com-Art Colors are specifically formulated for the airbrush. They are great for use on paper, illustration board and canvas. This water-based, mild cleaner will keep your Iwata airbrush clean and pristine. Superior-quality water-soluble color pencils for those with the most exacting requirements: artists, illustrators, graphic artists, art teachers. Lead: water-soluble, soft, Ø 3.8 mm, high breaking-strength, very economical thanks to their exceptional covering power. Bright colors, excellent lightfastness. Shaft: hexagonal, end-sealed in the same color as the lead, marked with color name and code. Techniques: crosshatching, graded applications, watercolor effects, washes, unlimited blending possibilities, mixed media - can be combined with Pablo permanent colour pencils, Neocolor artists’ crayons and gouache. For tips and techniques, download the Supracolor brochure. Caran d'Ache has designed an innovative Lightfast pencil with the highest lightfastness available today. Two years of research yielded a combination of unsurpassed lightfastness with the smoothness of a permanent lead, guaranteeing professionals and artists the world over that thier pencil works will survive. The softness of the leads enables artists to obtain subtle mixes and gradations, as well as blends. Every shade has been formulated using finely-ground pigments chosen for their purity, intensity and resistance to UV. 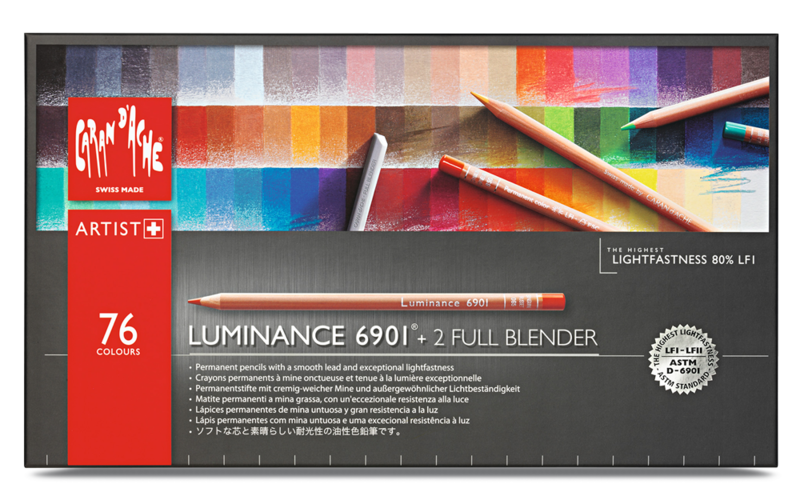 The chromatic range of Luminance 6901 is perfectly balanced and comes in sets of 20, 40 or 76 colors. Artists, designers, architects, stylists, art directors, interior designers - all creative professionals will appreciate the tchnical features, aesthtics and ergonomics of Luminance 6901. At the request of the Colord Pencil Society of America (CPSA), the American Society for Testing and Material has developed the standard ASTM D-6901 to determine the lightfast level of a colored pencil. 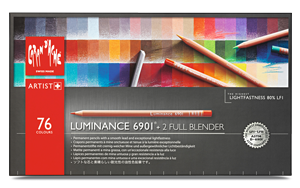 Caran d'Ache Luminance 6901 is the only brand to offer a set of 76 colors, of which 61 are classified in the best category (Lightfastness I) under the standard. Cut from California cedar, the Luminance 6901 colored pencils carry the FSC (Forest Stewardship Council) label, a guarantee that the logging of the materials used for the pencils is environmentally-friendly and socially and economically sustainable. 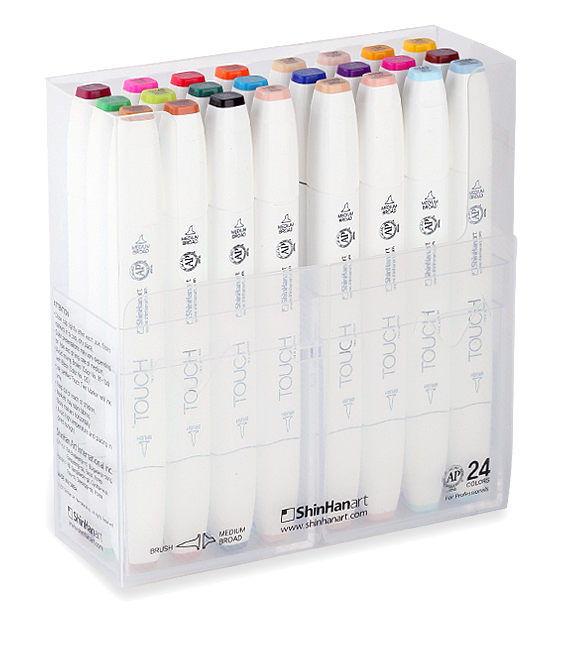 Designed for detailed work, ShinHan Art Touch Twin markers feature an advanced alcohol-based ink formula that ensures rich color saturation and coverage, with silky ink flow. Each Touch Twin marker features three distinct nibs (Fine, Chisel and Brush nib) to achieve a wide range of strokes, from fine lines to wide color fills. The Touch Twin brush marker features a distinct fine brush nib on one end and a medium-wide chisel nib on the other, allowing users to express a wider range of techniques. The innovative and durable design of the nibs ensures they will not lose their firmness over time. 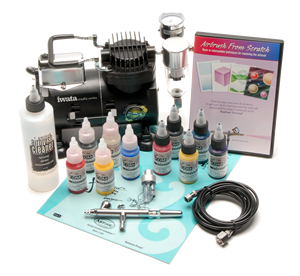 Optimum ink flow and drying rates allow for seamless execution of even the most detailed artwork. Refillable ink and replacement nibs add to the longevity of the Touch Twin Brush Markers. 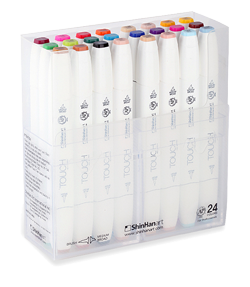 ShinHan Art’s Touch Twin markers are ideal for a diverse range of uses, from animation, illustration, architectural renderings, and interior design sketches. With a unique fine point nib on one side and a broad chisel nib on the other, the Touch Twin marker offers artists and designers a greater range of line thicknesses than ever before. The delivery of ink flow can be perfectly controlled to allow precision drawing. The ergonomically designed rectangular body is roll resists rolling on work surfaces and provides a perfect grip that avoids smudges and smears. A specially designed safety cap stacks neatly and prevents damage to the nibs. The new Touch Twin marker contains an alcohol-based ink that doesn’t dissolve printed ink toner, allowing for odorless, vividly colored artwork on printed materials. Refillable ink and replaceable nibs are also available for the Touch Twin marker. 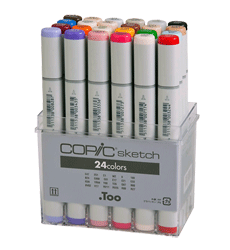 The Copic Sketch Marker is the most popular marker in the Copic line. 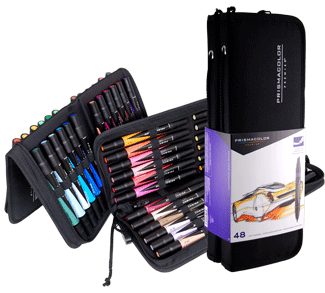 Perfect for professional illustration, sketchbooking, fashion design, manga, and craft projects. 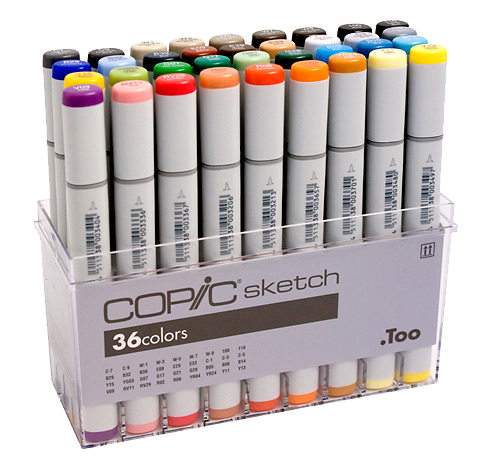 They come in all 346 Copic colors. 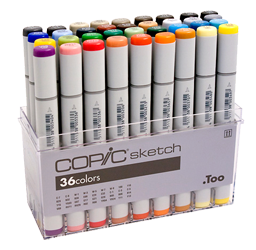 Empty Sketch Markers are also available so you can mix your own colors for custom markers. The replaceable Super Brush nib acts like a paintbrush in both feel and application. For more control, use the medium broad nib on the opposite end or customize the marker with an optional nib. 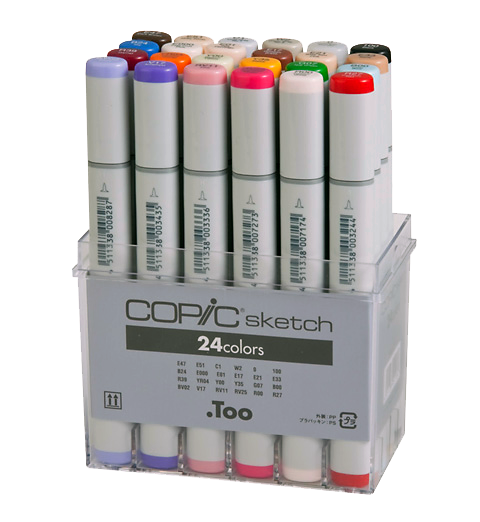 Like all Copic markers, Sketch markers feature refillable ink and replaceable nibs. Prismacolor Markers offer consistent ink flow and laydown, brilliant color and excellent ink coverage, with just the right amount of bleeding and spread. The unique four-in-one design allows you to create a variety of line styles from just one marker by increasing or decreasing the pressure, or simply turning the marker one way or another. Low odor. 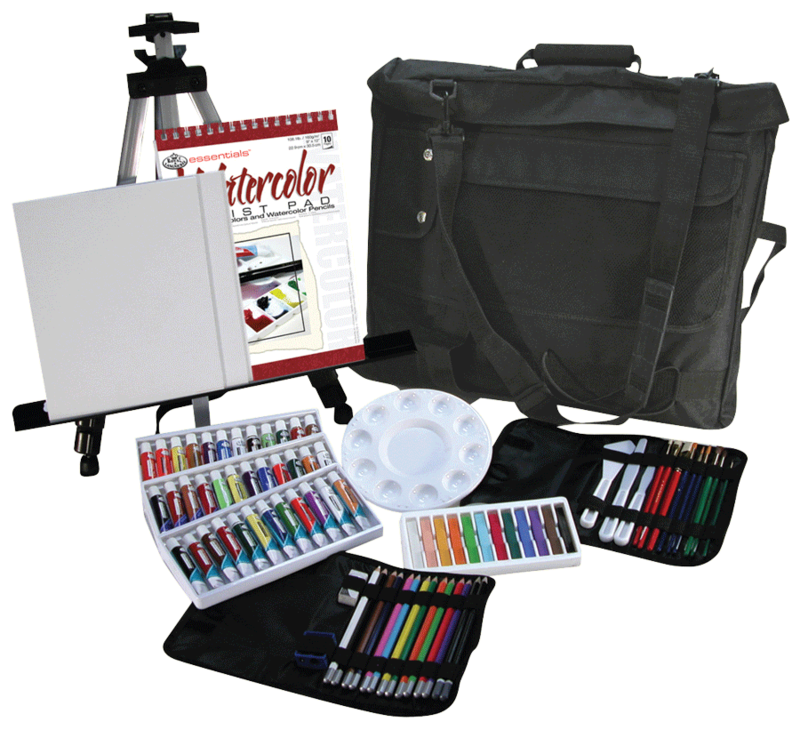 This set includes 48 Assorted Prismacolor Markers in two handy carrying cases, that fold into easels for easy accessibility. The colors above are electronic approximations. Actual colors may differ from the above representations. 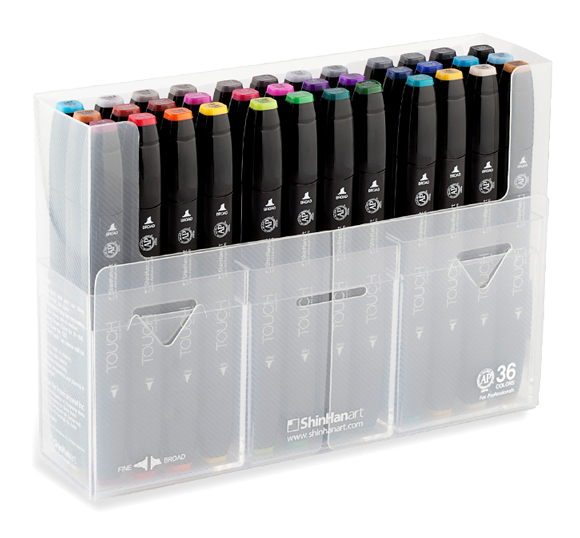 This set includes 48 Prismacolor Markers.